Are you new to the Village of Bloomingdale? Thank you for inquiring about a Bloomingdale Public Library card. Should you have any questions that are not answered here, or need additional assistance, please feel free to contact a staff member in the Circulation Department directly at (630) 924-2750. How do I apply for a Bloomingdale Public Library card? Anyone who lives within the Village of Bloomingdale and is 18 years or older may obtain a library card. In order to be issued a library card, each adult will need to provide one item from the Photo ID verification column (A) and one item from the Residency verification column (B). If the photo ID presented does not have your current Bloomingdale address on it, we will then need two items from the Residency Verification column (B). 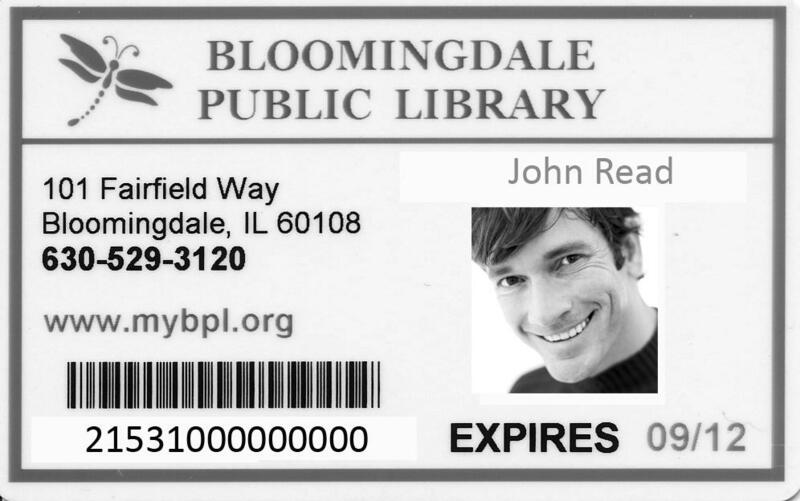 If you are unable to provide two forms of ID with your Bloomingdale address, please refer to the "What if I don’t have the required items to get a library card?" section below. What if I am under 18, or I want to get a Bloomingdale Library card for my minor child? Children, under the age of eighteen, must be accompanied by a parent or guardian when applying for a library card. The parent or legal guardian must supply acceptable identification and proof of residency as described above, and sign the statement of responsibility for the library card at the time the library card is issued. The signing parent/legal guardian will be the only adult who will be able to access the minor’s account information. How do I obtain a Bloomingdale Public Library Card application? In order to apply for a library card you may visit the library in person, or if you prefer, you can print and fill out the application ahead of time using the Patron Registration form. Please note: applicants must sign the form in person at the Circulation Desk of the library with a staff member, and proof of residency will be required from each applicant over 18 upon presentation of the form. Applicants under the age of 18 must have a parent or legal guardian who resides in the Village of Bloomingdale present at the time of registration. The parent or legal guardian will need to present proof of residency. What if I don’t have the required items to get a library card? If you are unable to present an item from both list A and B above, you may still apply for a library card on a provisional basis. In this circumstance, you must provide personal identification (photo with name) and proof of name and address. These two items may be the same (i.e., Drivers license or state ID). Library staff will mail your library card to your supplied home address in order to confirm residency. Your new account will be blocked until you bring in your new library card to activate the account. You are permitted to check out three items at the time you apply for your library card, and will have a limit of three items total until your card is activated with a Circulation staff member. Once the card is activated, the provisional status will be lifted and you may check out materials under the guidelines that govern all library transactions. Is there a charge to get a library card? There is no charge for a new library card if you are a Bloomingdale resident and live within the Village of Bloomingdale. If you live outside of the boundaries of the Village of Bloomingdale, and do not have a library in the town in which you live, please call the Circulation Desk directly at (630) 924-2750 for assistance. What if I have lost my library card, or it was stolen? If you've lost or misplaced your library card, or it was stolen, please contact the Circulation Desk at (630) 924-2750 immediately. The cardholder is responsible for all materials checked out on the library card, so it is important to let us know right away. Patrons may obtain 1 replacement card per calendar year. If you need additional replacement cards, the cost is $3.00 per card. You may also use your valid photo ID to check out materials. My Bloomingdale Public Library card is expired. What should I do? If your library card is expired, please bring it with you when you visit the library to update your card and account. You will be asked to verify your residency within the Village of Bloomingdale by showing one form of photo ID with your valid Bloomingdale address. I live in another town; is it possible for me to apply for a Bloomingdale Public Library card? While we cannot issue a Bloomingdale Public Library card to those who live outside of the Village of Bloomingdale boundaries, we can register your valid library card from the town you reside in (i.e., Roselle, Glendale Heights, etc.) as long as your account is in good standing at that library. If you live in an unincorporated area that does not receive any library services, please visit the library with a photo ID and a copy of your most recent tax bill. Circulation staff will let you know what the fee is to purchase a library card. I own property within the Village of Bloomingdale, but do not reside here. Would I be able to get a library card? Individuals who own property within the Village of Bloomingdale, but do not reside here, may apply for a card with a photo ID and a copy of their current property tax bill.